If you’ve decided to have a custom fish tank built; congratulations! You’ve made a great design choice, as an aquarium is a constant source of life and beauty in your home. Aquarium design is both art and science, as this ever-changing art installation isn’t just beautiful, it is also the place that your future aquatic roommates will call home. 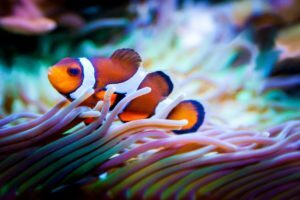 Whether you’re planning an aquarium design project in Pennsylvania or Delaware, there are a few important questions to ask before you hire an aquarium designer. Do they provide ongoing maintenance options? Once your aquarium is built, it’s important to be able to call on your aquarium designer if you need maintenance or have questions. At Armco, we offer a full suite of post-installation services. Services include biweekly or monthly visits, preventive maintenance, and moving your aquarium should you need to relocate. How do they treat their live stock? Your aquarium will be more than just something beautiful in the home. The inhabitants of your aquarium are living things that deserve to be well-cared for at every stage of their lives. Make sure that whoever you hire treats their live stock well and sources them responsibly. Are the aquarium designers experienced in many types of installations? Choose a team that has experience in all types of aquariums. Doing so will ensure that you get the best design for your space, not just the one they specialize in. You’ll want a team that is skilled in the installation and management of freshwater, saltwater, and coral tanks. When you’re hiring an aquarium designer to work with you on a custom project for your home or office, reliability counts. Armco Aquatics has been serving aquarium clients since 1999. We’ve completed more than 300 aquarium design projects for clients all over Pennsylvania and Delaware, including the Delaware Children’s Museum. Ready to Hire an Aquarium Designer in Pennsylvania? Call Armco Aquatics! Are you looking for an experienced aquarium designer in Pennsylvania or Delaware? Beyond experience, you’ll want to hire someone who is reliable, experienced, and dedicated to aquatic education. That’s just what you’ll get when you hire Armco Aquatics. Give us a call at 1-877-ARMCO-11 to schedule your consultation, or make an appointment to visit our brand new aquarium design center.